The Ubuntu Certification Website has just got better. We have roll-out improvements to how we list systems and provided a powerful search feature. We want to ensure that you get as quick as possible to the information that you need. Most models are sold with different graphics cards , processors… so which one is the one listed as certified? Does the system listed as certified works with a version of Ubuntu that I can download from Ubuntu.com? Or only with the one that the manufacturer sales? What release is this model certified for? To address these questions, we have introduced some changes to the website. We now display what components are included on the certified system in the search results. 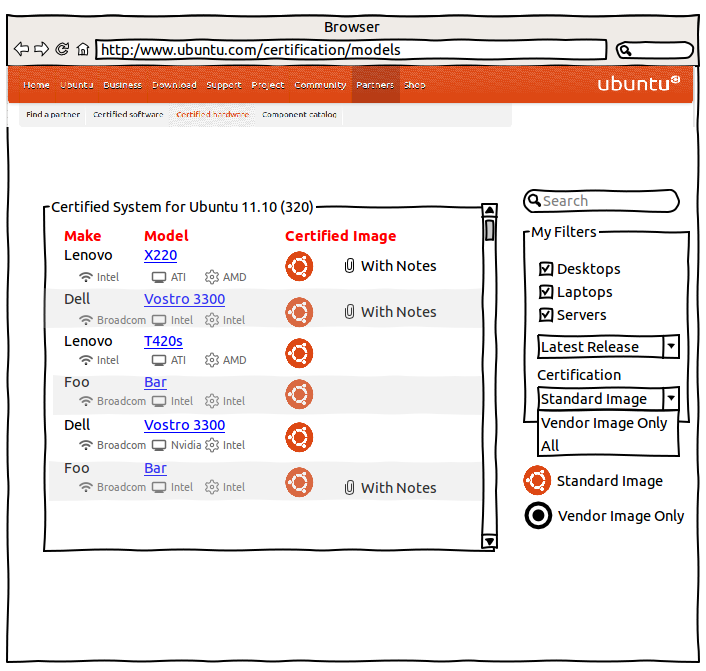 We’ve also added a icon to indicate if the system is only certified with a vendor image or with the standard Ubuntu image. The new and simpler search interface eliminates confusion on what data is presented. A small filter box has been added to the website allowing users to select the device type, Ubuntu release and image type that they are interested in. If you have any comments on the new website design, I would really like to hear from you! Next Post Going Agile: Scrum or Kanban? It looks good! I think it will be very helpful. I did find the icons confusing: both the Canonical and the Ubuntu icons look pretty official. Yes, a mouse-over shows the difference, but I doubt everyone will do that to discover what the icons represent. Perhaps somewhere on the page a key to what they mean could be placed. This makes the site a much better as an aid for initial purchase. I’m still concerned about the certication story and thus the utility to end-users as part of the retail/usage lifecycle when it comes to OS upgrade path. Why didn’t this laptop pass certification for 11.04 or beyond? Can the website actually start pointing to why previously certed hardware failed cert on newest OS as a starting point for some community self-service for continued hardware enablement. I’m not saying you can garuntee the future, that’s the OEMs job :-), but pointing out technical reasons and bug reports for cert failures for already cert’d systems might help the community fill in the gaps and get the hardware re-operational even if you don’t cert it. I would like to find a way to inform users why hardware does not pass certification or has been stop from being certified. I will put some thought into that.